Looking to make an accent wall? 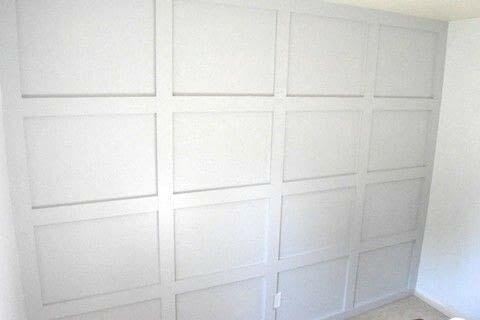 This DIY board & batten grid wall makes a serious statement in any room. 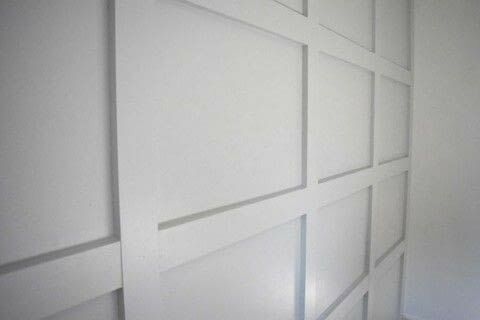 https://www.cutoutandkeep.net/projects/diy-board-and-batten-grid-wall • Posted by Marly D.
We knocked out the installation of this board and batten wall in one day, and we finished painting it the following day. If you’re looking for a weekend project that doesn’t cost an arm and a leg, this is it! It makes a HUGE difference in a space and can be completed in just two days. Measure the wall so you know how much wood you'll need to buy. Remove baseboard, if necessary. We had baseboard installed at the bottom of the wall so we removed it to make room for the new boards. To remove the baseboard, we used a sheetrock knife to score the caulk. 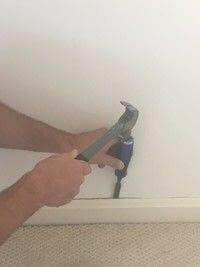 Then, we used the chisel and hammer to separate the baseboard from the wall. Install the boards. We installed the four poplar wood boards that made up the frame, or border, of the wall first. We grabbed the four boards that we bought for the frame and cut them with the miter saw to fit perfectly. Install the remaining vertical boards, leaving the horizontal boards to install last. This is where it got a bit more tedious. There’s a lot more cutting to do with the horizontal boards, as we needed to fill in the spaces between each vertical board. To install the boards, we measured the wall (again) and cut the boards to fit. It’s so important to measure right because you only get one chance to cut. 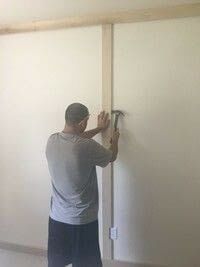 After the boards were cut, we used liquid nail glue with a caulk gun to secure them to the wall. While doing this, we used the level and square to ensure each board was perfectly straight. Then, we finished securing each board with nails, using the air gun and compressor, after ensuring we knew where the studs were by using a stud finder. Caulk. To give it a finished look, we applied caulk to the gaps. Sand and paint. The next day, after the caulk was dry, I gave the boards a quick sand and then painted the boards and wall. I used Behr paint in Sterling, with a satin sheen. 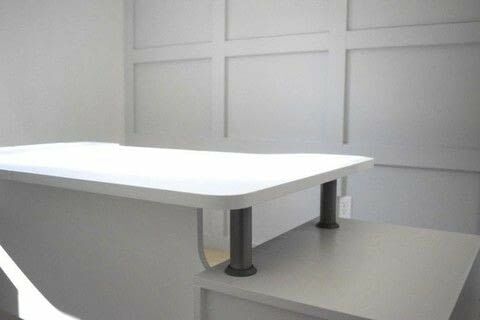 I thought about having my board and batten wall be bright white, but I wanted it to pop behind my white desk. Plus, my remaining three walls in my office are white, so I thought a different hue would work I love the way the light gray color contrasts against the rest of the room. Here’s the finished look.